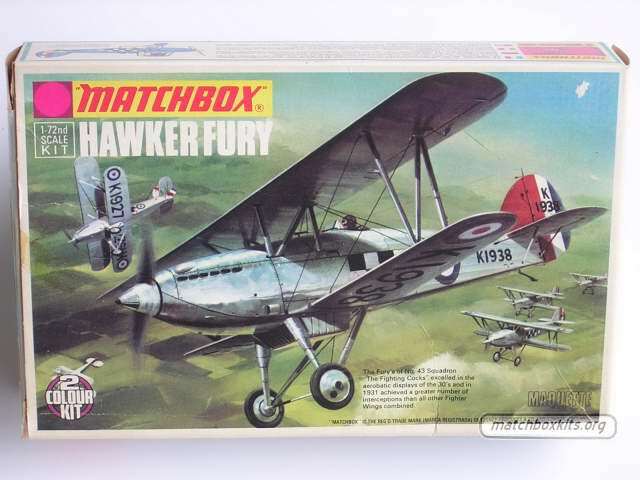 Some of the redesigns were purely made to fit the subject in a new style of packaging (Hawker Fury: pic # 1 and 2). By the end of the 70's EU regulations depicted that there should be no violence on the boxes, so the artwork was revised when the studio had time for it. For some kits a wholly new boxart was designed (FW 190, Hawker Hurricane: pic # 3, 4, 5 and 6), with the action some of the exitement of the scenes was lost. For other kits the boxart was updated in a more subtle way (Me 109E, Grumman Hellcat, Me 262, P47D Thunderbolt: pic # 7 to 14). The change in context really made a difference as suddenly a warbird was shown as if flying in a post-war flightshow. When comparing the boxart for the JU 87 Stuka the politically correct version shows an eerie scene where the action seemingly has quieted down (pic #15 and 16). Another reasons for changing the boxart was to follow the development of up to date colour schemes of display teams like the Red Arrows (BAe Hawk: pic # 17 to 19).